NYC, 02/22/2019, 2:00PM. 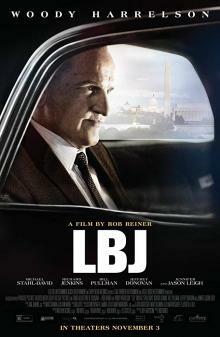 LBJ (2016): Political drama about an ex-president of US. 98 min. Director: Rob Reiner. Starring Woody Harrelson, Michael Stahl-David, Richard Jenkins. The movie was shot in New Orleans, Baton Rouge, Dallas, and Washington. LBJ had its world premiere at the Toronto International Film Festival on September 9, 2016.